Surely it can't get any worse than this? 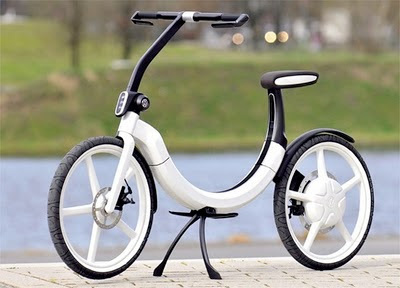 Last week it was Lexus, this week Volkswagen are showing off their concept electric bicycle the "Bik.e". Unfortunately Volkswagen's offering isn't hybrid electric, making its eligibility for an appearance on this blog a little dubious. Lacking pedals the Bik.e is more like a lame electric scooter than an electric bicycle. What does make this interesting though is that the Bik.e is designed to fold and fit into the space where you'd normally store a spare tire. Which is maybe something the makers of conventional folding bicycles should investigate. But with a bicycle in your cars spare tire bay, where are you going to keep your spare tire now? On your cars bicycle rack maybe? Ah .. all too confusing, I'm glad I don't own a car. Promising a range of 20km on a full charge and with a top speed of 20km/h, you'd be better off retaining your dignity on a conventional bicycle. On a related note, in Japan we've seen a lot of cheap, nasty, generic looking bicycles branded with the names of automakers including Chevrolet, Hummer, Jaguar, Land Rover, and even Lamborghini. I'm curious to know if that's just a Japanese thing or if they're available elsewhere too? besides being a touch to artsy, I think it is a great design and wonder how heavy this thing is ? Yes, over here in the UK from time to time. I bought some spares for my (cough cough) cccc'car a while back from the local Honda dealer & found a range of E bikes being sold in the showroom. Cheap, clunky, and guaranteed to put you off cycling in no time. I agree that the Bik.e looks nice, but like the Lexus model, its hardly useful.